Good morning!! Are there any coupon codes available for 5star Tuning? I have a 2015 F150 5.0 V8 FX4 with a K&N cold air intake and Flowmaster exhaust. I also have an SCT tuner and would like to purchase email tunes from you. My friend is actually the finance director at my local Ford dealer and he is the one who recommended you and gave me his tuner. This will be my first tune ever, I was thinking about getting 2 tunes (economy and performance) for 87 octane. Can you extend any special discount as a member of this forum? Howdy. In the Regular Cab picture thread, you posted this image of a red RC with a faux-Raptor grille and a front bumper. 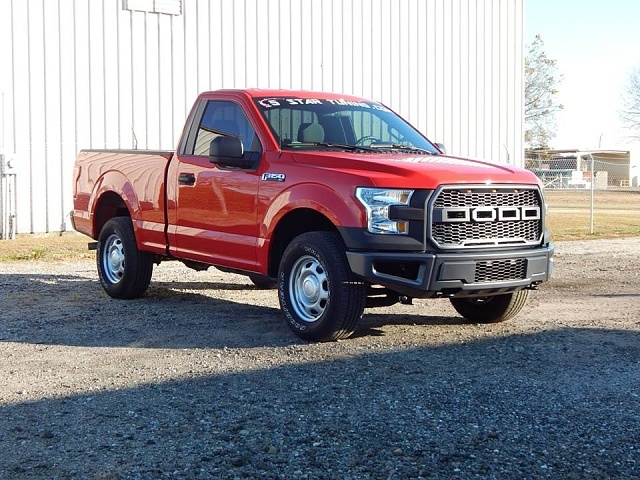 Would the front bumper work in place of my factory XLT chrome bumper and with my Sport 5-bar grill? Thanks. I was wondering if you still had any of the used eco tuners?? i am assuming no but figured i would ask. was also wondering what u are selling a new unit with the 3 custom tunes installed for?? do u have any forum deals?? I hit the send button before I finished my message. Currently I have a Superchips tuner can I still tune with the SCT 5 Star tune with a Superchips installed? Or do I need to restore it to stock then install? Let me know about the paypal options this is very important as I use this as my fun money account. I really want to give my fellow Carolina boys some business so let me know if using paypal is an option. Thanks for your help! Hey guys really interested in your tune for the Eco Boost Engine. I am actually in the process of trying to make a purchase on your website for the SCT SF3 with the custom tunes loaded package. Seems like the best value to get everything I want. However, my confusion is with the payment options. At the bottom of your home page it shows paypal as one of the options to make payment for an order. The problem is that it is not provided when i try to check out. Is paying for an order through my pay pal account an option? Hi 5star I also live in ontario, I just watched the video for the tuner, all i can say is OMG! I just ordered 2012 5L I'm sure the 2011 and 2012s are the same. what gear ratio is that. Plus thanks for the work you's are doing on the 5L, can't wait to see some hp numbers for stuff like the headers. I'm trying to find a good tune for my 11 f150 5.0L. I'm still waiting for the comments about Diablo Sports just released tune. Though i heard about a 5 Star tune. Does it work with Trinity T1000 box or do i have to get a SCT Programer ? And how does it work to get one custom for my truck since i live in Canada ?